For other uses, see Philips (disambiguation). Koninklijke Philips N.V. (literally Royal Philips, stylized as PHILIPS) is a Dutch multinational technology company headquartered in Amsterdam, one of the largest electronics companies in the world, currently focused in the area of healthcare and lighting. It was founded in Eindhoven in 1891 by Gerard Philips and his father Frederik, with their first products being light bulbs. It was once one of the largest electronic conglomerates in the world and currently employs around 74,000 people across 100 countries. The company gained its royal honorary title in 1998 and dropped the "Electronics" in its name in 2013. Philips is organized into two main divisions: Philips Consumer Health and Well-being (formerly Philips Consumer Electronics and Philips Domestic Appliances and Personal Care) and Philips Professional Healthcare (formerly Philips Medical Systems). The lighting division was spun off as a separate company, Signify N.V. (formerly Philips Lighting prior to 2018). The company started making electric shavers in 1939 under the Philishave brand, and post-war they developed the Compact Cassette format and co-developed the Compact Disc format with Sony, as well as numerous other technologies. As of 2012, Philips was the largest manufacturer of lighting in the world as measured by applicable revenues. Philips has a primary listing on the Euronext Amsterdam stock exchange and is a component of the Euro Stoxx 50 stock market index. It has a secondary listing on the New York Stock Exchange. Acquisitions include that of Signetics and Magnavox. They also have had a sports club since 1913 called PSV Eindhoven. 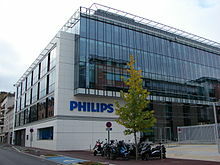 The Philips Company was founded in 1891, by Gerard Philips and his father Frederik Philips. Frederik, a banker based in Zaltbommel, financed the purchase and setup of an empty factory building in Eindhoven, where the company started the production of carbon-filament lamps and other electro-technical products in 1892. This first factory has been adapted and is used as a museum. In 1895, after a difficult first few years and near bankruptcy, the Philipses brought in Anton, Gerard's younger brother by sixteen years. Though he had earned a degree in engineering, Anton started work as a sales representative; soon, however, he began to contribute many important business ideas. With Anton's arrival, the family business began to expand rapidly, resulting in the founding of Philips Metaalgloeilampfabriek N.V. (Philips Metal Filament Lamp Factory Ltd.) in Eindhoven in 1908, followed in 1912, by the foundation of Philips Gloeilampenfabrieken N.V. (Philips Lightbulb Factories Ltd.). After Gerard and Anton Philips changed their family business by founding the Philips corporation, they laid the foundations for the later electronics multinational. In the 1920s, the company started to manufacture other products, such as vacuum tubes. In 1939, they introduced their electric razor, the Philishave (marketed in the US using the Norelco brand name). The "Chapel" is a radio with built-in loudspeaker, which was designed during the early 1930s. On 11 March 1927, Philips went on the air with shortwave radio station PCJJ (later PCJ) which was joined in 1929 by sister station PHOHI (Philips Omroep Holland-Indië). PHOHI broadcast in Dutch to the Dutch East Indies (now Indonesia) while PCJJ broadcast in English, Spanish and German to the rest of the world. The international program on Sundays commenced in 1928, with host Eddie Startz hosting the Happy Station show, which became the world's longest-running shortwave program. Broadcasts from the Netherlands were interrupted by the German invasion in May 1940. The Germans commandeered the transmitters in Huizen to use for pro-Nazi broadcasts, some originating from Germany, others concerts from Dutch broadcasters under German control. Philips Radio was absorbed shortly after liberation when its two shortwave stations were nationalised in 1947 and renamed Radio Netherlands Worldwide, the Dutch International Service. Some PCJ programs, such as Happy Station, continued on the new station. Philips was instrumental in the revival of the Stirling engine when, in the early 1930s, the management decided that offering a low-power portable generator would assist in expanding sales of its radios into parts of the world where mains electricity was unavailable and the supply of batteries uncertain. Engineers at the company's research lab carried out a systematic comparison of various power sources and determined that the almost forgotten Stirling engine would be most suitable, citing its quiet operation (both audibly and in terms of radio interference) and ability to run on a variety of heat sources (common lamp oil – "cheap and available everywhere" – was favored). They were also aware that, unlike steam and internal combustion engines, virtually no serious development work had been carried out on the Stirling engine for many years and asserted that modern materials and know-how should enable great improvements. Encouraged by their first experimental engine, which produced 16 W of shaft power from a bore and stroke of 30 mm × 25 mm, various development models were produced in a program which continued throughout World War II. By the late 1940s, the 'Type 10' was ready to be handed over to Philips's subsidiary Johan de Witt in Dordrecht to be produced and incorporated into a generator set as originally planned. The result, rated at 180/200 W electrical output from a bore and stroke of 55 mm × 27 mm, was designated MP1002CA (known as the "Bungalow set"). Production of an initial batch of 250 began in 1951, but it became clear that they could not be made at a competitive price, besides with the advent of transistor radios with their much lower power requirements meant that the original rationale for the set was disappearing. Approximately 150 of these sets were eventually produced. In parallel with the generator set, Philips developed experimental Stirling engines for a wide variety of applications and continued to work in the field until the late 1970s, though the only commercial success was the 'reversed Stirling engine' cryocooler. However, they filed a large number of patents and amassed a wealth of information, which they later licensed to other companies. The first Philips shaver was introduced in the 1930s, and was simply called Philishave. In the US, it was called Norelco. The Philishave has remained part of the Philips product line-up until the present. On 9 May 1940, the Philips directors learned that the German invasion of the Netherlands was to take place the following day. Having prepared for this, Anton Philips and his son in law Frans Otten, as well as other Philips family members, fled to the United States, taking a large amount of the company capital with them. Operating from the US as the North American Philips Company, they managed to run the company throughout the war. At the same time, the company was moved (on paper) to the Netherlands Antilles to keep it out of German hands. On 6 December 1942, the British No. 2 Group RAF undertook Operation Oyster, which heavily damaged the Philips Radio factory in Eindhoven with few casualties among the Dutch workers and civilians. The Philips works in Eindhoven was bombed again by the RAF on 30 March 1943. Frits Philips, the son of Anton, was the only Philips family member to stay in the Netherlands. He saved the lives of 382 Jews by convincing the Nazis that they were indispensable for the production process at Philips. In 1943, he was held at the internment camp for political prisoners at Vught for several months because a strike at his factory reduced production. For his actions in saving the hundreds of Jews, he was recognized by Yad Vashem in 1995 as a "Righteous Among the Nations". After the war, the company was moved back to the Netherlands, with their headquarters in Eindhoven. In 1949, the company began selling television sets. In 1950, it formed Philips Records, which eventually formed part of PolyGram. Philips introduced the audio Compact Audio Cassette tape in 1963, and it was wildly successful. Compact cassettes were initially used for dictation machines for office typing stenographers and professional journalists. As their sound quality improved, cassettes would also be used to record sound and became the second mass media alongside vinyl records used to sell recorded music. Philips introduced the first combination portable radio and cassette recorder, which was marketed as the "radiorecorder", and is now better known as the boom box. Later, the cassette was used in telephone answering machines, including a special form of cassette where the tape was wound on an endless loop. The C-cassette was used as the first mass storage device for early personal computers in the 1970s and 1980s. Philips reduced the cassette size for the professional needs with the Mini-Cassette, although it would not be as successful as the Olympus Microcassette. This became the predominant dictation medium up to the advent of fully digital dictation machines. Philips continued with computers through the early 1990s (see separate article: Philips Computers). In 1972, Philips launched the world's first home video cassette recorder, in the UK, the N1500. Its relatively bulky video cassettes could record 30 minutes or 45 minutes. Later one-hour tapes were also offered. 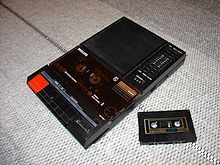 As competition came from Sony's Betamax and the VHS group of manufacturers, Philips introduced the N1700 system which allowed double-length recording. For the first time, a 2-hour movie could fit onto one video cassette. In 1977, the company unveiled a special promotional film for this system in the UK, featuring comedian Denis Norden. The concept was quickly copied by the Japanese makers, whose tapes were significantly cheaper. Philips made one last attempt at a new standard for video recorders with the Video 2000 system, with tapes that could be used on both sides and had 8 hours of total recording time. As Philips only sold its systems on the PAL standard and in Europe, and the Japanese makers sold globally, the scale advantages of the Japanese proved insurmountable and Philips withdrew the V2000 system and joined the VHS Coalition. Philips had developed a LaserDisc early on for selling movies, but delayed its commercial launch for fear of cannibalizing its video recorder sales. Later Philips joined with MCA to launch the first commercial LaserDisc standard and players. In 1982, Philips teamed with Sony to launch the Compact Disc; this format evolved into the CD-R, CD-RW, DVD and later Blu-ray, which Philips launched with Sony in 1997 and 2006 respectively. In 1984, the Dutch Philips Group bought out nearly a one-third share and took over the management of German company Grundig. In 1984, Philips split off its activities on the field of photolithographic integrated circuit production equipment, the so-called wafer steppers, into a joint venture with ASM International, located in Veldhoven under the name ASML. Over the years, this new company has evolved into the world's leading manufacturer of chip production machines at the expense of competitors like Nikon and Canon. In 1991, the company's name was changed from N.V. Philips Gloeilampenfabrieken to Philips Electronics N.V. At the same time, North American Philips was formally dissolved, and a new corporate division was formed in the US with the name Philips Electronics North America Corp. In 1991-1992, Philips along with their subsidiary Magnavox, released the Philips CD-i, a combined CD player and home video game console. It sold one million units and was discontinued in 1998 after being heavily criticized amongst the gaming community. In 1997, the company officers decided to move the headquarters from Eindhoven to Amsterdam along with the corporate name change to Koninklijke Philips Electronics N.V., the latter of which was finalized on 16 March 1998. The move of the headquarters to Amsterdam was completed in 2001. Initially, the company was housed in the Rembrandt Tower. In 2002, it moved again, this time to the Breitner Tower. Philips Lighting, Philips Research, Philips Semiconductors (spun off as NXP in September 2006) and Philips Design, are still based in Eindhoven. Philips Healthcare is headquartered in both Best, Netherlands (near Eindhoven) and Andover, Massachusetts, United States (near Boston). In 2000, Philips bought Optiva Corporation, the maker of Sonicare electric toothbrushes. The company was renamed Philips Oral Healthcare and made a subsidiary of Philips DAP. In 2001, Philips acquired Agilent Technologies' Healthcare Solutions Group (HSG) for EUR 2 billion. Philips created a computer monitors joint venture with LG called LG.Philips Displays in 2001. In 2004, Philips abandoned the slogan "Let's make things better" in favour of a new one: "Sense and Simplicity". In December 2005, Philips announced its intention to sell or demerge its semiconductor division. 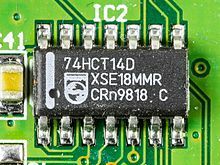 On 1 September 2006, it was announced in Berlin that the name of the new company formed by the division would be NXP Semiconductors. On 2 August 2006, Philips completed an agreement to sell a controlling 80.1% stake in NXP Semiconductors to a consortium of private equity investors consisting of Kohlberg Kravis Roberts & Co. (KKR), Silver Lake Partners and AlpInvest Partners. On 21 August 2006, Bain Capital and Apax Partners announced that they had signed definitive commitments to join the acquiring consortium, a process which was completed on 1 October 2006. In 2006, Philips bought out the company Lifeline Systems headquartered in Framingham, Massachusetts in a deal valued at $750 million, its biggest move yet to expand its consumer-health business (M). In August 2007, Philips acquired the company Ximis, Inc. headquartered in El Paso, Texas for their Medical Informatics Division. In October 2007, it purchased a Moore Microprocessor Patent (MPP) Portfolio license from The TPL Group. On 21 December 2007, Philips and Respironics, Inc. announced a definitive agreement pursuant to which Philips acquired all of the outstanding shares of Respironics for US$66 per share, or a total purchase price of approximately €3.6 billion (US$5.1 billion) in cash. On 21 February 2008, Philips completed the acquisition of VISICU Baltimore, Maryland through the merger of its indirect wholly owned subsidiary into VISICU. As a result of that merger, VISICU has become an indirect wholly owned subsidiary of Philips. VISICU was the creator of the eICU concept of the use of Telemedicine from a centralized facility to monitor and care for ICU patients. The Philips physics laboratory was scaled down in the early 21st century, as the company ceased trying to be innovative in consumer electronics through fundamental research. In January 2011, Philips agreed to acquire the assets of Preethi, a leading India-based kitchen appliances company. On 27 June 2011, Philips acquired Sectra Mamea AB, the mammography division of Sectra AB. Because net profit slumped 85 percent in Q3 2011, Philips announced a cut of 4,500 jobs to match part of an €800 million ($1.1 billion) cost-cutting scheme to boost profits and meet its financial target. In 2011, the company posted a loss of €1.3 billion, but earned a net profit in Q1 and Q2 2012, however the management wanted €1.1 billion cost-cutting which was an increase from €800 million and may cut another 2,200 jobs until end of 2014. In March 2012, Philips announced its intention to sell, or demerge its television manufacturing operations to TPV Technology. 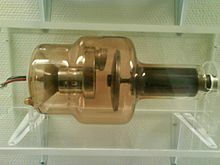 On 5 December 2012, the antitrust regulators of the European Union fined Philips and several other major companies for fixing prices of TV cathode-ray tubes in two cartels lasting nearly a decade. On 29 January 2013, it was announced that Philips had agreed to sell its audio and video operations to the Japan-based Funai Electric for €150 million, with the audio business planned to transfer to Funai in the latter half of 2013, and the video business in 2017. As part of the transaction, Funai was to pay a regular licensing fee to Philips for the use of the Philips brand. The purchase agreement was terminated by Philips in October because of breach of contract and the consumer electronics operations remain under Philips. Philips said it would seek damages for breach of contract in the US$200-million sale. In April 2016, the International Court of Arbitration ruled in favour of Philips, awarding compensation of €135 million in the process. In April 2013, Philips announced a collaboration with Paradox Engineering for the realization and implementation of a "pilot project" on network-connected street-lighting management solutions. This project was endorsed by the San Francisco Public Utilities Commission (SFPUC). In 2013, Philips removed the word "Electronics" from its name - becoming Royal Philips N.V. On 13 November 2013, Philips unveiled its new brand line "Innovation and You" and a new design of its shield mark. The new brand positioning is cited by Philips to signify company's evolution and emphasize that innovation is only meaningful if it is based on an understanding of people's needs and desires. On 28 April 2014, Philips agreed to sell their Woox Innovations subsidiary (consumer electronics) to Gibson Brands for $US135 million. On 23 September 2014, Philips announced a plan to split the company into two, separating the lighting business from the healthcare and consumer lifestyle divisions. It moved to complete this in March 2015 to an investment group for $3.3 billion. In February 2015, Philips acquired Volcano Corporation to strengthen its position in non-invasive surgery and imaging. In June 2016, Philips spun off its lighting division to focus on the healthcare division. In June 2017, Philips announced it would acquire US-based Spectranetics Corp, a manufacturer of devices to treat heart disease, for €1.9 billion (£1.68 billion) expanding its current image-guided therapy business. In 2018, the lighting products division known as Philips Lighting N.V. was renamed Signify N.V. It continues to produce and market Philips-branded products such as Philips Hue color-changing LED light bulbs. In January 2013, Hugo Barbosa Vazquez was hired to own market analysis and forecasting activities across all Philips businesses (Consumer Lifestyle, Healthcare and Lighting) and geographies. Companies acquired by Philips through the years include ADAC Laboratories, Agilent Healthcare Solutions Group, Amperex, ATL Ultrasound, EKCO, Lifeline Systems, Magnavox, Marconi Medical Systems, Mullard, Optiva, Preethi, Pye, Respironics, Inc., Sectra Mamea AB, Signetics, VISICU, Volcano, VLSI, Ximis, portions of Westinghouse and the consumer electronics operations of Philco and Sylvania. Philips abandoned the Sylvania trademark which is now owned by Havells Sylvania except in Australia, Canada, Mexico, New Zealand, Puerto Rico and the USA where it is owned by Osram. Formed in November 1999 as an equal joint venture between Philips and Agilent Technologies, the light-emitting diode manufacturer Lumileds became a subsidiary of Phillips Lighting in August 2005 and a fully owned subsidiary in December 2006. An 80.1 percent stake in Lumileds was sold to Apollo Global Management in 2017. Philips is registered in the Netherlands as a naamloze vennootschap and has its global headquarters in Amsterdam. At the end of 2013, Philips had 111 manufacturing facilities, 59 R&D Facilities across 26 countries and sales and service operations in around 100 countries. Philips is organized into three main divisions: Philips Consumer Lifestyle (formerly Philips Consumer Electronics and Philips Domestic Appliances and Personal Care), Philips Healthcare (formerly Philips Medical Systems) and Philips Lighting. Philips achieved total revenues of €22.579 billion in 2011, of which €8.852 billion were generated by Philips Healthcare, €7.638 billion by Philips Lighting, €5.823 billion by Philips Consumer Lifestyle and €266 million from group activities. At the end of 2011, Philips had a total of 121,888 employees, of whom around 44% were employed in Philips Lighting, 31% in Philips Healthcare and 15% in Philips Consumer Lifestyle. Philips invested a total of €1.61 billion in research and development in 2011, equivalent to 7.1% of sales. Philips Intellectual Property and Standards is the group-wide division responsible for licensing, trademark protection and patenting. Philips currently holds around 54,000 patent rights, 39,000 trademarks, 70,000 design rights and 4,400 domain name registrations. Philips Thailand was established in 1952. It is a subsidiary which produces healthcare, lifestyle and lighting products. Philips started manufacturing in Thailand in 1960 with an incandescent lamp factory. Philips has diversified its production facilities to include a fluorescent lamp factory and a luminaries factory, serving Thai and worldwide markets. Philips Hong Kong began operation in 1948. Philips Hong Kong houses the global headquarters of Philips' Audio Business Unit. It also house Philips' Asia Pacific regional office and headquarters for its Design Division, Domestic Appliances & Personal Care Products Division, Lighting Products Division and Medical System Products Division. In 1974, Philips opened a lamp factory in Hong Kong. This has a capacity of 200 million pieces a year and is certified with ISO 9001:2000 and ISO 14001. Its product portfolio includes prefocus, lensend and E10 miniature light bulbs. 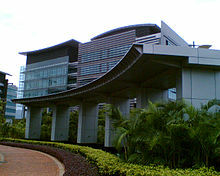 Philips established in Zhuhai, Guangdong in 1990. The site mainly manufactures Philishaves and healthcare products. In early 2008, Philips Lighting, a division of Royal Philips Electronics, opened a small engineering center in Shanghai to adapt the company's products to vehicles in Asia. Philips began operations in India in 1930, with the establishment of Philips Electrical Co. (India) Pvt Ltd in Kolkata as a sales outlet for imported Philips lamps. In 1938, Philips established its first Indian lamp-manufacturing factory in Kolkata. In 1948, Philips started manufacturing radios in Kolkata. In 1959, a second radio factory was established near Pune. This was closed and sold around 2006. In 1957, the company converted into a public limited company, renamed "Philips India Ltd". In 1970, a new consumer electronics factory began operations in Pimpri near Pune. This is now called the 'Philips Healthcare Innovation Centre'. Also, a manufacturing facility 'Philips Centre for Manufacturing Excellence' was set up in Chakan, Pune in 2012. In 1996, the Philips Software Centre was established in Bangalore, later renamed the Philips Innovation Campus. In 2008, Philips India entered the water purifier market. In 2014, Philips was ranked 12th among India's most trusted brands according to the Brand Trust Report, a study conducted by Trust Research Advisory. Philips has been active in Israel since 1948 and in 1998, set up a wholly owned subsidiary, Philips Electronics (Israel) Ltd. The company has over 700 employees in Israel and generated sales of over $300 million in 2007. Philips Medical Systems Technologies Ltd. (Haifa) is a developer and manufacturer of Computerized Tomography (CT), diagnostic and Medical Imaging systems. The company was founded in 1969 as Elscint by Elron Electronic Industries and was acquired by Marconi Medical Systems in 1998, which was itself acquired by Philips in 2001. Philips Semiconductors formerly had major operations in Israel; these now form part of NXP Semiconductors. Philips has been active in Pakistan since 1948 and has a wholly owned subsidiary, Philips Pakistan Limited (Formerly Philips Electrical Industries of Pakistan Limited). The head office is in Karachi with regional sales offices in Lahore and Rawalpindi. Philips France has its headquarters in Suresnes. The company employs over 3600 people nationwide. Philips Lighting has manufacturing facilities in Chalon-sur-Saône (fluorescent lamps), Chartres (automotive lighting), Lamotte-Beuvron (architectural lighting by LEDs and professional indoor lighting), Longvic (lamps), Miribel (outdoor lighting), Nevers (professional indoor lighting). Philips Germany was founded in 1926 in Berlin. Now its headquarters is located in Hamburg. Over 4900 people are employed in Germany. Distribution center of the divisions Healthcare, Consumer Lifestyle, and Lighting. Philips Innovative Technologies, Research Laboratories. Philips Medical Systems, patient monitoring systems. Philips Photonics, development and manufacture of vertical laser diodes (VCSELs) and photodiodes for sensing and data communication. Philips' Greece is headquartered in Halandri, Attica. As of 2012, Philips has no manufacturing plants in Greece, although there have been in the past. Philips founded its Italian headquarter in 1918, basing it in Monza (Milan) where it still operates, for commercial activities only. Philips founded PACH (Philips Assembly Centre Hungary) in 1992, producing televisions and consumer electronics in Székesfehérvár. After TPV entering the Philips TV business, the factory was moved under TP Vision, the new joint-venture company in 2011. Products have been transferred to Poland and China and factory was closed in 2013. By Philips acquiring PLI in 2007 another Hungarian Philips factory emerged in Tamási, producing lamps under the name of Philips IPSC Tamási, later Philips Lighting. The factory was renamed to Signify in 2017, still producing Philips lighting products. Philips' operations in Poland include: a European financial and accounting centre in Łódź; Philips Lighting facilities in Bielsko-Biała, Pabianice, Piła, and Kętrzyn; and a Philips Domestic Appliances facility in Białystok. Philips started business in Portugal in 1927, as "Philips Portuguesa S.A.R.L.". [self-published source?] Currently, Philips Portuguesa S.A. is headquartered in Oeiras near Lisbon. There were three Philips factories in Portugal: the FAPAE lamp factory in Lisbon; the Carnaxide magnetic-core memory factory near Lisbon, where the Philips Service organization was also based; and the Ovar factory in northern Portugal making camera components and remote control devices. The company still operates in Portugal with divisions for commercial lighting, medical systems and domestic appliances. Philips Sweden has two main sites, Kista, Stockholm County, with regional sales, marketing and a customer support organization and Solna, Stockholm County, with the main office of the mammography division. Philips UK has its headquarters in Guildford. The company employs over 2500 people nationwide. Philips Healthcare Informatics, Belfast develops healthcare software products. Philips Consumer Products, Guildford provides sales and marketing for televisions, including High Definition televisions, DVD recorders, hi-fi and portable audio, CD recorders, PC peripherals, cordless telephones, home and kitchen appliances, personal care (shavers, hair dryers, body beauty and oral hygiene ). Philips Lighting: sales from Guildford and manufacture in Hamilton. Philips Healthcare, Guildford. Sales and technical support for X-ray, ultrasound, nuclear medicine, patient monitoring, magnetic resonance, computed tomography, and resuscitation products. Philips Business Communications, Cambridge: offered voice and data communications products, specialising in Customer Relationship Management (CRM) applications, IP Telephony, data networking, voice processing, command and control systems and cordless and mobile telephony. In 2006 the business was placed into a 60/40 joint venture with NEC. NEC later acquired 100% ownership and the business was renamed NEC Unified Solutions. Philips Electronics Blackburn; vacuum tubes, capacitors, delay-lines, Laserdiscs, CDs. Philips Domestic Appliances Hastings: Design and Production of Electric kettles, Fan Heaters plus former EKCO brand "Thermotube" Tubular Heaters and "Hostess" Domestic Food Warming Trolleys. Philips Semiconductors, Hazel Grove, Stockport and Southampton, both also earlier part of Mullard. These became part of NXP. London Carriers, logistics and transport division. Philips Canada was founded in 1934. It is well known in medical systems for diagnosis and therapy, lighting technologies, shavers, and consumer electronics. The Canadian headquarters are located in Markham, Ontario. For several years, Philips manufactured lighting products in two Canadian factories. The London, Ontario, plant opened in 1971. It produced A19 lamps (including the "Royale" long life bulbs), PAR38 lamps and T19 lamps (originally a Westinghouse lamp shape). Philips closed the factory in May 2003. The Trois-Rivières, Quebec plant was a Westinghouse facility which Philips continued to run it after buying Westinghouse's lamp division in 1983. Philips closed this factory a few years later, in the late 1980s. Philips Mexicana SA de CV is headquartered in Mexico City. Philips Lighting has manufacturing facilities in: Monterrey, Nuevo León; Ciudad Juárez, Chihuahua; and Tijuana, Baja California. Philips Consumer Electronics has a manufacturing facility in Ciudad Juárez, Chihuahua. Philips Domestic Appliances formerly operated a large factory in the Industrial Vallejo sector of Mexico City but this was closed in 2004. Philips' Electronics North American headquarters is in Andover, Massachusetts. In early 2018, it was announced that the US headquarters would move to Cambridge, Massachusetts by 2020. Philips Lighting has its corporate office in Somerset, New Jersey, with manufacturing plants in Danville, Kentucky, Dallas, Salina, Kansas and Paris, Texas and distribution centers in Mountain Top, Pennsylvania El Paso, Texas, Ontario, California and Memphis, Tennessee. Philips Healthcare is headquartered in Cambridge, Massachusetts and operates a health-tech hub in Nashville, Tennessee with over 1000 jobs. The North American sales organization is based in Bothell, Washington. There are also manufacturing facilities in Andover, Massachusetts, Bothell, Washington, Baltimore, Maryland, Cleveland, Ohio, Foster City, California, Gainesville, Florida, Milpitas, California and Reedsville, Pennsylvania. Philips Healthcare also formerly had a factory in Knoxville, Tennessee. Philips Consumer Lifestyle has its corporate office in Stamford, Connecticut. Philips Lighting has a Color Kinetics office in Burlington, Massachusetts. Philips Research North American headquarters is in Cambridge, Massachusetts. In 2007, Philips entered into a definitive merger agreement with North American luminaires company Genlyte Group Incorporated, which provides the company with a leading position in the North American luminaires (also known as "lighting fixtures"), controls and related products for a wide variety of applications, including solid state lighting. The company also acquired Respironics, which was a significant gain for its healthcare sector. On 21 February 2008, Philips completed the acquisition of VISICU Baltimore, Maryland. VISICU was the creator of the eICU concept of the use of Telemedicine from a centralized facility to monitor and care for ICU patients. Philips Australia was founded in 1927 and is headquartered in North Ryde, New South Wales and also manages the New Zealand operation from there. The company currently employs around 800 people. Regional sales and support offices are located in Melbourne, Brisbane, Adelaide, Perth and Auckland. Current activities include: Philips Healthcare (also responsible for New Zealand operations); Philips Lighting (also responsible for New Zealand operations); Phillips Oral Healthcare, Phillips Professional Dictation Solutions, Phillips Professional Display Solutions, Phillips AVENT Professional, Philips Consumer Lifestyle (also responsible for New Zealand operations); Philips Sleep & Respiratory Care (formerly Respironics), with its ever-increasing national network of Sleepeasy Centres ; Philips Dynalite (Lighting Control systems, acquired in 2009, global design and manufacturing centre) and Philips Selecon NZ (Lighting Entertainment product design and manufacture). Philips do Brasil (Portuguese: Philips do Brasil) was founded in 1924 in Rio de Janeiro. In 1929, Philips started to sell radio receivers. In the 1930s, Philips was making its light bulbs and radio receivers in Brazil. From 1939 to 1945, World War II forced Brazilian branch of Philips to sell bicycles, refrigerators and insecticides. After the war, Philips had a great industrial expansion in Brazil, and was among the first groups to establish in Manaus Free Zone. In the 1970s, Philips Records was a major player in Brazil recording industry. Nowadays, Philips do Brasil is one of the largest foreign-owned companies in Brazil. Philips uses the brand Walita for domestic appliances in Brazil. color television was introduced in South America by the rich (and at that time CEO) Cor Dillen. Philips subsidiary Philips-Duphar(nl) manufactured pharmaceuticals for human and veterinary use and products for crop protection. Duphar was sold to Solvay in 1990. In subsequent years, Solvay sold off all divisions to other companies (crop protection to UniRoyal, now Chemtura, the veterinary division to Fort Dodge, a division of Wyeth, and the pharmaceutical division to Abbott Laboratories). PolyGram, Philips' music television and movies division, was sold to Seagram in 1998; merged into Universal Music Group. Philips Records continues to operate as record label of UMG, its name licensed from its former parent. Origin, now part of Atos Origin, is a former division of Philips. ASM Lithography is a spin-off from a division of Philips. Hollandse Signaalapparaten was a manufacturer of military electronics. The business was sold to Thomson-CSF in 1990 and is now Thales Nederland. NXP Semiconductors, formerly known as Philips Semiconductors, was sold a consortium of private equity investors in 2006. On 6 August 2010, NXP completed its IPO, with shares trading on NASDAQ. Philips used to sell major household appliances (whitegoods) under the name Philips. After selling the Major Domestic Appliances division to Whirlpool Corporation it changed from Philips Whirlpool to Whirlpool Philips and finally to just Whirlpool. Whirlpool bought a 53% stake in Philips' major appliance operations to form Whirlpool International. Whirlpool bought Philips' remaining interest in Whirlpool International in 1991. Philips Cryogenics was split off in 1990 to form the Stirling Cryogenics BV, Netherlands. This company is still active in the development and manufacturing of Stirling cryocoolers and cryogenic cooling systems. Polymer Vision was a Philips spin-off that manufactured a flexible e-ink display screen. The company closed in 2009. LED bulbs made by Philips. In 1913, in celebration of the 100th anniversary of the liberation of the Netherlands, Philips founded Philips Sports Vereniging (Philips Sports Club, now commonly known as PSV). The club is active in numerous sports but is now best known for its football team, PSV Eindhoven, and swimming team. Philips owns the naming rights to Philips Stadion in Eindhoven, which is the home ground of PSV Eindhoven. Outside of the Netherlands, Philips sponsors and has sponsored numerous sports clubs, sports facilities and events. In November 2008, Philips renewed and extended its F1 partnership with AT&T Williams. Philips owns the naming rights to the Philips Championship, the premier basketball league in Australia, traditionally known as the National Basketball League. From 1988 to 1993, Philips was the principal sponsor of the Australian rugby league team The Balmain Tigers and Indonesian football club side Persiba Balikpapan. From 1998 to 2000, Philips sponsored the Winston Cup #7 entry for Geoff Bodine Racing, later Ultra Motorsports, for drivers Geoff Bodine and Michael Waltrip. From 1999 to 2018, Philips held the naming rights to Philips Arena in Atlanta, home of the Atlanta Hawks of the National Basketball Association and former home of the defunct Atlanta Thrashers of the National Hockey League. Outside of sports, Philips sponsors the international Philips Monsters of Rock festival. Philips and its CEO, Frans van Houten, hold several global leadership positions in advancing the circular economy, including as a founding member and co-chair of the Board of Directors for the Platform for Accelerating the Circular Economy (PACE), applying circular approaches in its capital equipment business, and as a Global Partner of the Ellen MacArthur Foundation. Philips also runs the EcoVision initiative which commits to a number of environmentally positive improvements, focusing on energy efficiency. Also, Philips marks its "green" products with the Philips Green Logo, identifying them as products that have a significantly better environmental performance than their competitors or predecessors. In 2011, Philips won a $10 million cash prize from the US Department of Energy for winning its L-Prize competition, to produce a high-efficiency, long operating life replacement for a standard 60-W incandescent lightbulb. The winning LED lightbulb, which was made available to consumers in April 2012, produces slightly more than 900 lumens at an input power of only 10 W.
In Greenpeace's 2012 Guide to Greener Electronics, that ranks electronics manufacturers on sustainability, climate and energy and how green their products are, Philips ranks 10th place with a score of 3.8/10. The company was the top scorer in the Energy section due to its energy advocacy work calling upon the EU to adopt a 30% reduction for greenhouse gas emissions by 2020. It is also praised for its new products which are free from PVC plastic and BFRs. However, the guide criticizes Phillips' sourcing of fibres for paper, arguing it must develop a paper procurement policy which excludes suppliers involved in deforestation and illegal logging. Philips have made some considerable progress since 2007 (when it was first ranked in this guide), in particular by supporting the Individual Producer Responsibility principle, which means that the company is accepting the responsibility for the toxic impacts of its products on e-waste dumps around the world. ^ a b c "Philips Annual Report 2018". Philips Results. 27 February 2019. Retrieved 6 March 2019. ^ a b c "Philips Annual Report 2018 - Compare the previous 5 years". Philips Results. 27 February 2019. Retrieved 6 March 2019. ^ a b c d e f g "Annual Report 2014". Philips. Retrieved 19 August 2012. ^ "Börse Frankfurt (Frankfurt Stock Exchange): Stock market quotes, charts and news". Boerse-frankfurt.de. Retrieved 7 April 2018. 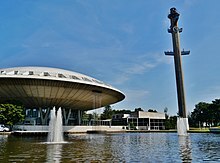 ^ "Philips Museum". Philips-museum.com. Retrieved 30 December 2016. ^ "Philips Electronics NV | Dutch manufacturer". Encyclopedia Britannica. ^ "BBC - WW2 People's War - Operation Oyster, Part 1". Bbc.co.uk. Retrieved 30 December 2016. ^ Everitt, Chris; Middlebrook, Martin (2 April 2014). "The Bomber Command War Diaries: An Operational Reference Book". Pen and Sword. Retrieved 30 December 2016 – via Google Books. ^ Bruce, Mr A I. "30th March 1943 WWII Timeline". Wehrmacht-history.com. Archived from the original on 12 February 2017. Retrieved 30 December 2016. ^ "Frits Philips celebrates 100th birthday". Philips. 15 April 2005. Retrieved 10 January 2015. ^ "Waarom stopt Philips met zelf televisies maken?". de Volkskrant. 18 April 2011. Retrieved 18 April 2011. ^ "BFI – Film & TV Database – The Philips Time Machine (1977)". The British Film Institute Web Database. Retrieved 16 February 2010. ^ Snow, Blake (5 May 2007). "The 10 Worst-Selling Consoles of All Time". GamePro.com. Archived from the original on 8 May 2007. Retrieved 1 November 2016. ^ "Philips Completes Acquisition Agilent Technologies' Healthcare Solutions Group". Thefreelibrary.com. Retrieved 6 January 2017. ^ "Philips electronics to buy lifeline to expand in consumer health". Wsj.com. Retrieved 7 April 2018. ^ "Philips to Acquire Healthcare Informatics Company XIMIS Inc. to Strengthen Presence in the Healthcare Information Technology Market". Finanznachrichten.de. Retrieved 7 April 2018. ^ "News center - Philips". Arquivo.pt. Archived from the original on 16 May 2016. Retrieved 7 April 2018. ^ "Philips completes acquisition of US-based VISICU". Newscenter.philips.com. 21 February 2008. Retrieved 24 November 2012. ^ NRC Handelsblad, 4 September 2010 Het nieuwe Philips wordt blij van een iPad-hoesje/The new Philips becomes happy from an iPad cover, Dutch original:" 'We zijn geen high-tech bedrijf meer, het gaat erom dat de technologieën introduceren die breed gedragen worden door de consument', zegt Valk [..] Consumer Lifestyle is nu zodanig ingericht dat er geen jaren meer gewerkt wordt aan uitvindingen die weinig kans van slagen hebben. [..]De Philips staf windt er geen doekjes om dat het bedrijf niet altijd voorop loopt bij de technologische ontwikkelingen in consumentengoederen." ^ "Philips to merge Preethi biz in future". Moneycontrol.com. 5 September 2012. Retrieved 6 January 2017. ^ "Sectra news and press releases - Sectra and Philips sign large mammography modality acquisition deal". Sectra.com. Archived from the original on 22 April 2016. Retrieved 8 April 2016. ^ "Philips to cut 4,500 jobs". The Guardian. 17 October 2011. ^ "Philips Electronics cuts another 2,200 jobs". Bbc.co.uk. 11 September 2012. Retrieved 7 April 2018. ^ Lezhnev, Sasha; Alex Hellmuth (August 2012). "Taking Conflict Out of Consumer Gadgets: Company Rankings on Conflict Minerals 2012" (PDF). Enough Project. Retrieved 17 August 2012. ^ "Philips, LG Electronics, 4 others fined 1.47 billion Euros for EU cartel". The Economic Times. 5 December 2012. Retrieved 5 December 2012. ^ Van, Robert. (29 January 2013) Philips Exits Consumer Electronics - The Source - WSJ. Blogs.wsj.com. Retrieved on 2013-08-16. ^ a b "Philips to exit hi-fis and DVD players". BBC News. 29 January 2013. Retrieved 2 February 2013. ^ "Philips exits shrinking home entertainment business". Reuters. 29 January 2013. Retrieved 2 February 2013. ^ Philips to take legal action against Funai. Broadbandtvnews.com (25 October 2013). Retrieved on 2013-12-09. ^ Sterling, Toby; Mari Yamaguchi. "Philips Breaks off Deal With Funai". ABC News. Amsterdam. Associated Press. Archived from the original on 2 November 2013. Retrieved 22 June 2014. ^ "Philips announces decision by ICC International Court of Arbitration in Funai arbitration case". Philips Electronics. 26 April 2016. Retrieved 23 July 2016. ^ "Paradox Engineering and Philips Lighting working together on smart city solutions". startupticker.ch. Retrieved on September 2013. ^ "Koninklijke Philips Electronics N.V.: Name change" (PDF). eurex. 15 May 2013. Retrieved 10 July 2013. ^ "Philips unveils new brand direction centered around innovation and people". Newscenter.philips.com. Retrieved 20 November 2013. ^ "Dutch electronics giant Philips plans to split business". Bbc.com. Retrieved 23 September 2014. ^ Tartwijk, Maarten Van (31 March 2015). "Philips Sells Majority Stake in LED Components, Automotive Business". Wall Street Journal. Retrieved 30 December 2016. ^ Escritt, Thomas. "Philips expands in medical devices with $1.2 billion Volcano deal". Reuters.com. Retrieved 7 April 2018. ^ "Subscribe to read". Ft.com. Retrieved 30 December 2016. ^ "Philips lighting is now Signify". Signify. 16 May 2018. Retrieved 10 July 2018. ^ Whitaker, Tim (19 August 2005). "Analysis: Philips acquires controlling stake in Lumileds". www.ledsmagazine.com. Retrieved 6 March 2019. ^ "Philips announces 100% ownership of Lumileds". www.ledsmagazine.com. 1 January 2007. Retrieved 6 March 2019. ^ "Lumileds Officially an Independent Company as Funds Affiliated with Apollo Global Management and Philips Complete Transaction". Lumileds. Retrieved 6 March 2019. ^ "Interactive world maps". Annualreport2013.philips.com. Retrieved 30 December 2016. ^ Nieuwhof, Marc (15 November 2010). "IP.Philips.com". IP.Philips.com. Retrieved 27 January 2011. ^ a b "(Company profile – Philips Hong Kong)". Philips.com.hk. Retrieved 27 January 2011. ^ "珠海经济特区飞利浦家庭电器有限公司联系方式_信用报告_工商信息－启信宝". Qixin.com. Retrieved 7 April 2018. ^ "Bangalore.philips.com". Bangalore.philips.com. Retrieved 24 November 2012. ^ "India's Most Trusted Brands 2014". Archived from the original on 2 May 2015. ^ "Philips Israel- Company Overview". Philips.co.il. Retrieved 1 May 2010. ^ "Philips Pakistan - Company Overview". Philips.com.pk. Retrieved 17 October 2011. ^ "Philips Deutschland - Philips". Philips.de. Retrieved 30 December 2016. ^ "Philips Portuguesa". Restosdecoleccao.blogspot.pt. Retrieved 7 April 2018. ^ a b "História Local - Philips". Philips.pt. Retrieved 30 December 2016. ^ "Google Maps". Google.pt. Retrieved 30 December 2016. ^ a b Portugal, Philips. "Philips Portugal manufacturer in P, radio technology from Po". Radiomuseum.org. Retrieved 30 December 2016. ^ "Artigos Project : Global Report Volume 20" (PDF). Pardalmonteiro.com. Archived from the original (PDF) on 3 March 2016. Retrieved 7 April 2018. ^ "Philips - Portugal". Philips.pt. Retrieved 30 December 2016. ^ "philips uk - Google Maps". Maps.google.co.uk. Retrieved 24 November 2012. ^ "Dutch firm Philips to move North American headquarters from Andover to Cambridge". The Boston Globe. Retrieved 7 April 2018. ^ "Philips Brasil Home Page". 30 December 1996. Archived from the original on 30 December 1996. Retrieved 7 April 2018. ^ John Biggs, Tech Crunch. "Welcome To The Future: Polymer Vision Demos SVGA Rollable Screen." 27 May 2011. Retrieved 27 May 2011. ^ Lewis, Gareth (15 July 2009). "50 jobs go at Polymer Vision". Southern Daily Echo. Retrieved 6 January 2016. ^ "Products & Solutions". Philips Healthcare. Retrieved 28 January 2012. ^ "LED 12.5W A19 Soft White 12.5W (60W) Dimmable A19". Energy-saving light bulbs. Philips. ^ "Indoor Luminaires". Philips Lighting. Retrieved 4 March 2016. ^ "Outdoor Luminaires". Philips Lighting. Retrieved 4 March 2016. ^ "Lamps". Philips Lighting. Retrieved 4 March 2016. ^ "Lighting Controls". Philips Lighting. Retrieved 27 June 2016. ^ "Digital projection lighting". Philips Lighting. Retrieved 27 June 2016. ^ "Horticulture". Philips Lighting. Retrieved 27 June 2016. ^ "Solar". Philips Lighting. Retrieved 27 June 2016. ^ "Lighting systems for office & industry". Philips Lighting. Retrieved 4 March 2016. ^ "Retail and hospitality systems". Philips Lighting. Retrieved 4 March 2016. ^ "Lighting systems: for public spaces". Philips Lighting. Retrieved 4 March 2016. ^ "Choose a bulb". Philips Lighting. Retrieved 27 June 2016. ^ "Choose a lamp". Philips Lighting. Retrieved 27 June 2016. ^ "Philips Hue homepage". Philips Lighting. Retrieved 27 June 2016. ^ "The 64 Slice CT Scanner". Web.archive.org. Archived from the original on 10 March 2016. Retrieved 30 December 2016. ^ "Philips Shield Wordmark Timeline" (JPG). Philips.com. Retrieved 7 April 2018. ^ "Platform for Accelerating the Circular Economy". Platform for Accelerating the Circular Economy. Retrieved 2 April 2019. ^ "History of the Ellen MacArthur Foundation". www.ellenmacarthurfoundation.org. Retrieved 2 April 2019. ^ "Ford tops Interbrand's fourth annual ranking as the "greenest" brand in 2014". POPSOP. 13 August 2014. Retrieved 6 March 2019. ^ "Philips – Our Green Products". Philips. Retrieved 7 January 2011. ^ Margery Conner, EE Times. "$10M L Prize goes to Philips for 60W replacement LED bulb." 3 August 2011. Retrieved 5 August 2011. ^ "DOE Announces Philips as First Winner of the L Prize Competition". US Department of Energy. Archived from the original on 6 August 2011. Retrieved 6 August 2011. ^ "Guide to Greener Electronics | Greenpeace International". Greenpeace.org. Retrieved 24 November 2012. ^ "Guide to Greener Electronics – Greenpeace International". Greenpeace International. Retrieved 14 November 2011. ^ "Philips Greenpeace International". Greenpeace International. Archived from the original on 31 October 2010. Retrieved 7 January 2011. Wikimedia Commons has media related to Philips. This page was last edited on 7 April 2019, at 16:31 (UTC).